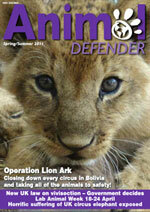 Welcome to the Animal Defender Magazine, Spring 2011. We have selected our key articles for you to read, just click on the links below. The Home Office has told us that they plan to have draft legislation prepared by the autumn with a view to this being implemented by late 2012. Our global campaign to end space experiments has been given a massive boost with NASA halting its proposed experiments on squirrel monkeys.